In the forensic laboratories at the FBI Academy in Quantico, Virginia, explosives experts are leading the investigation into how Monday's bombs in Boston were put together and who could be behind them. There is plenty of physical evidence but few clues as to the motive. Across the world, counter-terrorism and intelligence officers are scratching their heads, looking at possible suspects and whether such an attack could happen in their own cities. Rightly, they are wary of jumping to premature conclusions. When al-Qaeda bombed Madrid's train stations in 2004 the Spanish government wrongly blamed the Basque separatist movement Eta, and when the Norwegian neo-fascist gunman Anders Breivik murdered 77 people in Oslo, many immediately assumed it to be the work of jihadists. So what lines is the Boston investigation following and why? As of Wednesday, this is thought to be the most likely culprit. The FBI maintains a long list of potential threats emanating from US individuals or groups harbouring violent intentions towards the federal government, civil organisations, or society in general. The list includes white racial supremacists, fundamentalist Christian extremists, animal rights activists and anti-abortionists. So-called "lone wolf" operators - individuals not belonging to any known terrorist group - are far harder for the authorities to detect and track. It took them more than seven years to catch the man who planted a pipe bomb at the 1996 Atlanta Olympics and more than 17 years to catch the Unabomber in 1996. Yet a recent report found that one-third of all domestic terrorist attacks in the US since 1995 have been carried out by lone individuals. 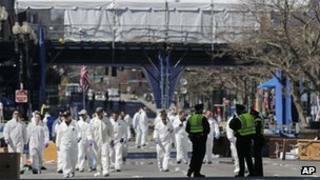 Like the London bombings of July 2005, the Boston bombings represent an intelligence failure, but US authorities say they had no warning. The attack appears to have come out of the blue and it is notable that it was aimed not at government but at the general public. This is still an active line of pursuit. The explosive devices used follow a model broadly similar to ones promoted by al-Qaeda in an online magazine in 2010 that encouraged jihadists to make their own bombs. But experts say it is a relatively basic model that predates al-Qaeda. The US has recently escaped a number of attempts by lone jihadists to carry out attacks in New York and elsewhere. Unlike the huge, centrally directed attacks of 9/11, solo operators need only be inspired, not trained, by the core leadership of al-Qaeda. America has long been their favoured target, but there are reasons to question whether this was the work of jihadists. There is no suicide element, the explosive used was relatively low power and, most importantly, there has been no claim of responsibility. The almost complete absence of any warnings, tip-offs or claims of responsibility are steering investigators away from this line for now. "It doesn't feel like something directed from overseas", said one counter-terrorism expert. Even the Pakistani Taliban, which has threatened attacks against mainland America, were quick to say they didn't do it. Bad as the body count was from Monday's attack - three dead and more than 170 injured - a pre-planned attack directed and funded from overseas would be looking to inflict a far higher death toll. All the recent terrorist plots intercepted in the UK and traced back to al-Qaeda in Pakistan have aimed to kill hundreds, if not thousands, of individuals. There has been some online celebration by jihadists hoping the bombings will turn out to be in al-Qaeda's name. But in Britain the Manchester-based Ramadhan Foundation, a Muslim body dedicated to peaceful co-existence, has issued a statement reminding people that: "Islam forbids terrorism, it is evil, and anyone carrying out such disgusting crimes does not do it in the name of Islam or Muslims." This is considered the least likely avenue. North Korea and Iran are both sworn enemies of the US but neither country is thought likely to want to invite US retribution - and even further international isolation - by carrying out an attack like this. North Korea almost certainly lacks the capacity on the ground to carry it out, while many still doubt if Iran was really behind its alleged assassination attempt on the Saudi ambassador to Washington in 2011. So for now, the focus of the investigation remains domestic, with the priority being placed on forensic evidence from the scene, surveillance tapes, and witness statements. But if and when an international dimension is found then the net of investigation will be thrown far and wide, pulling in countries like Britain which has already offered its full support.